In the 33rd issue of the Bed and Breakfast Traveller, we take you to St. Jacobs, a lovely Waterloo Region village filled with features to delight guests, year round. There is no such thing as the wrong day to visit St. Jacobs. HISTORICAL VILLAGE: St. Jacobs can lay claim to a remarkable number of firsts. 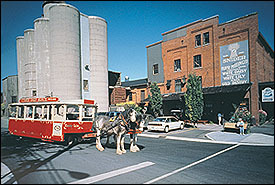 The village is the site of the first commercial creamery in Ontario. It was the first police village to have hydro-electricity and the first community to have a flour mill shipping to the United Kingdom. And, it is the site of the very first Home Hardware store. Visitors can learn more about Village history with a new, self-guided historical walking tour brochure, available for $2. at The Mennonite Story, 1406 King St. The route travels north across the Conestoga River to the E.W.B. Snider Monument, and then explores Isabella, Spring and Cedar Streets. You'll discover 30 different points of interest, including the boyhood home of everyone's favourite Toronto Maple Leaf, Darryl Sittler. SHOPPING SPREE: For shopping, it does not get any better than the shops of St. Jacobs. The village is filled with shops of all kinds - on the main street, along side streets, tucked into the former mill (even its silos) - and there are lots more, slightly farther afield, such as the St. Jacobs outlet mall. Happy visitors go home with perfect seasonal gifts, new pieces of art, intriguing Waterloo County handcrafts and furniture, food that really, really schmecks, antiques, clothing, toys . . . the list is literally endless. The shops of St. Jacobs are famed for their personal service, and for their unique environments and range of unique items. A stroll through the shops of St. Jacobs will find you discovering unique ladies' fashions; discovering just the right accent piece with an authentic county touch; evaluating a huge range of antiques (before touring the Maple Syrup Museum that is included in the three-storey Antique Market); browsing through thousands of antique architectural furnishings, from fire-place to finials; lingering in shops selling edibles ranging from peanuts to preserves; finding just the right piece of original art; and planning your garden design in shops featuring intriguing statuary and furniture. In St. Jacobs you can buy ironware - and watch the blacksmith who made it at work. 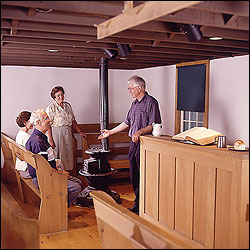 You can buy pottery, or stained glass, and linger to watch the craftsmen at their wheels and kilns. DINING: In fact, there are plenty of reasons to linger in St. Jacobs. There are wonderful restaurants, some offering sophisticated cuisine and others famous for authentic, Waterloo County home-cooked fare. ARTS & CRAFTS: Visitors can also learn to make their own crafts, by signing up for a craft class, or simply to appreciate the skill of the artisans, by watching quilters, painters, potters, stained glass artists, and more. MENNONITE COUNTRY: You will soon notice that not everyone has arrived in St. Jacobs by car or tour bus - the town is the home community of a large number of old order Mennonites, who come to town via horse and buggy. You may notice the working water troughs for horses even before you noticed the horses themselves. Visitors keen to learn more about the Mennonite faith and lifestyle can enjoy an interpretive centre that tells the Mennonite story with clarity and creativity, in the downtown area. 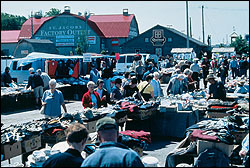 COUNTRY MARKETS: The St. Jacobs Country's Farmers' Market and Flea Market feature over 600 vendors. 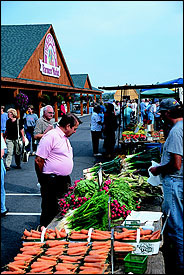 Visitors find the Market irresistible, and they're not alone - thousands of regional residents stock their larders at the market on a weekly basis. And if that's not enough - there is a second market just across the road. The St. Jacobs Farmers' Market and Flea Market are open Thursday and Saturday, year round, from 7 a.m. to 3:30 p.m. Summer months it's open Tuesday as well. Visitors enjoy live performances by buskers, and on market days, you can catch a ride on Country Livery Services' Horse Drawn Tours. Just across the road, Waterloo Farmers' Market is open Saturdays, year round, from 7 a.m. to 2 p.m. Furthermore, nearby is another shopper's paradise - the St. Jacobs Factory Outlet Mall, also open year-round. Nearby are countryside furniture outlets, and a cidery and winery. LIVE THEATRE: The Village is home to two historic theatre and music venues - the St. Jacobs Schoolhouse Theatre and the Church Theatre. For details and tickets, call (519)664-1134. Take Hwy. 401 to the Hwy. 8 exit. Get on Hwy.86 north and follow it to regional road 15 until you reach St. Jacobs. The above has been extracted from "VISITOR, vol. 25, no. 1, fall/winter 2002" with the permission of the editor. Photographs courtesy of St. Jacobs Country.